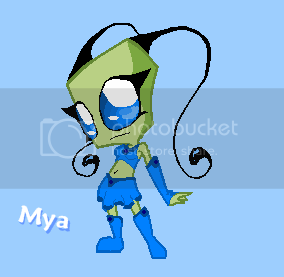 Mya is just a Normal Alien but don't be fooled by her appearance, her words are sweet but sometimes she has a attitude that would...urm I don't know but something really bad! 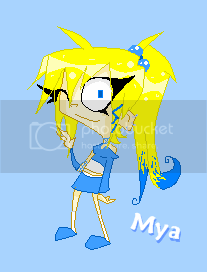 Smile , anyways, Mya is invader that was sent to earth for something very important, like a warning, but she missed the message wen she crash't down to the ground in a near by field in England she got hit by rocket or a plane of some sort. Mya was lost on earth with no contact what so ever, so she lived on earth in England most her Alien life undercover with the only device she had, a device that can turn to what aver she desires, but she mostly uses it to disguise has a human to be undercover so since Mya lives in England most of her life she has strong British ascent. Mya knows Mel by her mothers best friend has her adopted daughter, witch it was her first option to be in a foster home so she could blend in with the crowd. The small green disguised Alien lived with her foster mother f she didn't really needed a job since her foster mother was rich, spoiling her beyond belief but in Mya's christal blue eyes didn't care. She only expects her foster mother has a thing to keep her to fit in with the humans, One day, Mel's mother invited her best friend and Mya to stay with her as long as they want. So Mya and Mel are staying together sharing a room, Mel's room. don't forget about M1r, Mya knows that M1r is a sir unit since there are some like her/him at her home planet. Not like Mel, she thinks that M1r a new living toy like a tamagachi or something, Now Mya has to live with Mel and her ood family undercover hiding her secret has a Alien. But not only that, try contact the Tallest to go back to her home planet. If you have any question, pm me and I'll answer mkay? byebye~!!!!! I like her human form's hair.